Barry N. Middleton has well over a decade of experience practicing law in Georgia. 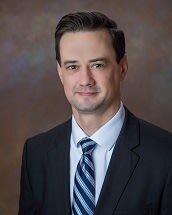 During that time, he has achieved successful results for clients in multiple jury trials in Superior Court and Civil Court, and he has won numerous bench trials and dispositive motions in Georgia trial courts of various jurisdictions. Mr. Middleton’s experience also extends to appellate representation where he has obtained decisions in favor of his clients in Georgia’s Supreme Court and Court of Appeals. Mr. Middleton’s practice encompasses a broad spectrum of litigation matters. He has specific experience in divorce and child custody disputes, construction litigation, business litigation, real estate, probate and criminal law. A large part of Mr. Middleton’s practice comes from other lawyers and judges that refer clients to him. Mr. Middleton is from Evans, Georgia and presently lives in Columbia County. He enjoys spending his free time with his two small children.